Looking for family-friendly rides and attractions? Dutch Wonderland has something for everyone! Frog Hopper, a kids' favorite by leaps and bounds. This ride is reserved for children and one adult/taller companion per ride. Pedal your way to fun in our kid-friendly pedal cars! Hop around in a frog-themed vehicle with Huck Finn! Which horse will you ride? Choose your favorite seat on the Merry-Go-Round! This ride is for all heights. Under 42" must be accompanied by a responsible rider. Hand-held infants are permitted on the chariot bench seats only. Embark on a picturesque canal cruise around the inner rim of Exploration Island. Join Merlin on a magical journey through Dutch Wonderland on this high-flying coaster to find our friend, Mayhem. Minimum height of 39" required. Under 48" must be accompanied by a responsible rider. You'll fly through the air with the greatest of ease on Dutch Wonderland's very fine Flying Trapeze. The kid-friendly Kingdom Coaster takes you to new heights of fun. Under 54" must be accompanied by a responsible rider. Blast off on the Space Shuttle Enterprise for your swinging adventure. Up, up, and away! Take the scenic route on Sky Ride. Under 48” must be accompanied by an adult who is 18 years of age or older. Say this ten times fast: On the Fun Slide the smiles go on for miles and miles. Everyone's favorite train ride - Wonderland Special. Under 42” must be accompanied by a responsible rider. Bumper Cars are a classic favorite with kids, adults, and anyone who thinks they own the road! Take flight in a hang glider inspired ride! It's an oasis of summer water fun for kids. Plus a seating area for parents and grandparents! The tropical island themed attraction includes water-spilling coconuts, spectacular water geysers, and bubblers. Duke’s Lagoon is open Memorial Day Weekend – Labor Day, opening at 10am and closing at dusk. Junior astronauts take their space adventure on Sky Fighter. "Bon Voyage Balloon Chase" takes guests on a magical ride on one of 8 flying hot air balloons where every seat has a view. Under 36" must be accompanied by a responsible rider. No hand-held infants. Which slide will you choose: black or blue? Under 48” must be accompanied by a responsible rider. No hand-held infants. Must wear shoes in order to ride. Experience over 20 lifelike dinosaurs up-close as you explore the Prehistoric Path at your own pace. This mini steel coaster will take you on a knightly journey! Uncover the past in our fossil dig area! Wonder House will turn your whole world upside down. Dodging asteroids is only the beginning of your trip on VR Voyager. Want to see kids smile? Watch 'em go round on the Wonder Whip! Join the fun on Panda Party. Take your trip around the beehive. Repeat after me: Little dirt diggers love Duke's Dozers. Take a detour to Off-Road Rally, where kids are in the driver's seat. Under 36" must be accompanied by a responsible rider. This ride is reserved for children and one adult/taller companion per ride. Adult/taller companion must sit in the back seat only. No hand-held infants. Blast off to an adventure in the Astroliner rocket ride. Mission control, we don't have a problem. Sit back, relax, and enjoy a bird's eye view of A KINGDOM FOR KIDS! Under 48" must be accompanied by a responsible rider. The Twister is a circular-motion ride designed for the entire family. The 20-seat ride spins guests horizontally, and then starts fluctuating in a wavelike manner. Under 48” must be accompanied by a responsible rider. Putter along the outer rim of Exploration Island while you keep an eye out for dinosaurs. Under 54” must be accompanied by a responsible rider. Get ready for some head-spinning fun on this family-friendly tilt-a-whirl. Double Splash Log Flume is double the fun! Escape a menacing dragon! Ride a log boat through Dragon's Lair if you dare. What makes Choo Choo Charlie run? Please try a different selection to find what you're looking for! Other restrictions such as, but not limited to, height and weight limitations may apply at specific rides. Please contact us prior to your visit if there are any questions or concerns in regards to ride restrictions and guidelines. 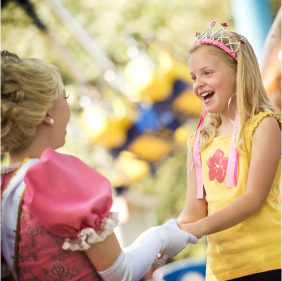 Find out which rides & attractions are the perfect fit for your child using our Rides & Attractions Intensity Guide. Click here to learn more about our Accessibility Program for guests with accessibility needs. With over 35 rides, attractions, and shows, Dutch Wonderland is the perfect place to spend family time. Cool off in Duke’s Lagoon water play area (Memorial Day Weekend - Labor Day) and make discoveries at Exploration Island, where dinosaurs come to life! With over 30 fun-filled rides, Dutch Wonderland is “A Kingdom for Kids!” Dutch Wonderland is designed for families with young children and offers a host of fun things to do, including rides just for kids! Kids can whirl around with Wonder Whip, become an astronaut with Sky Fighter, or even become friends with a panda on Panda Party. Dutch Wonderland has plenty of kid attractions and activities, but even more rides that the whole family can enjoy together! Drive a car at the Turnpike or twirl around on Turtle Whirl. The amount of family friendly fun is endless at Dutch Wonderland! Start planning your Dutch Wonderland trip today! Day tickets and season passes are available for purchase online or at the gate. Enjoy a day of rides, shows, dining, and family fun.